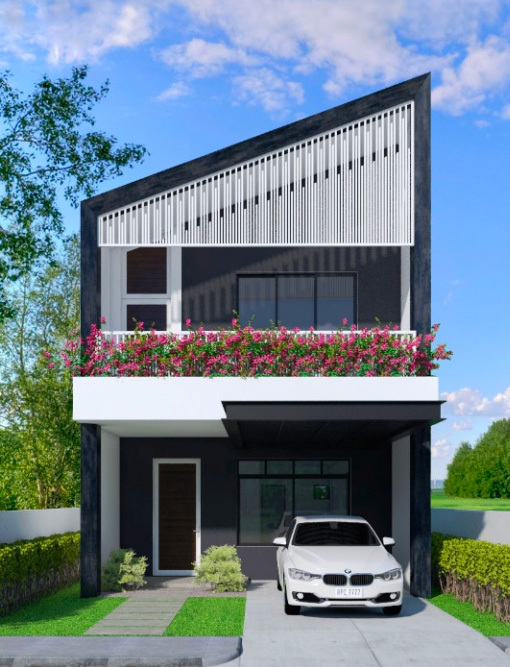 Never let the modest size of your home restrict your sense of style–someone somewhere must once have said. If they didn’t, then we’ve just said it, right then. So let’s get serious. Serious about the brave punch of style that each of these four little interior designs have whacked into their truly restricted dimensions. From big bright colour pops and large kitsch art prints to oversized statement lighting and expanses of bold patterned tiling, these little gems have got it all and more to boot. 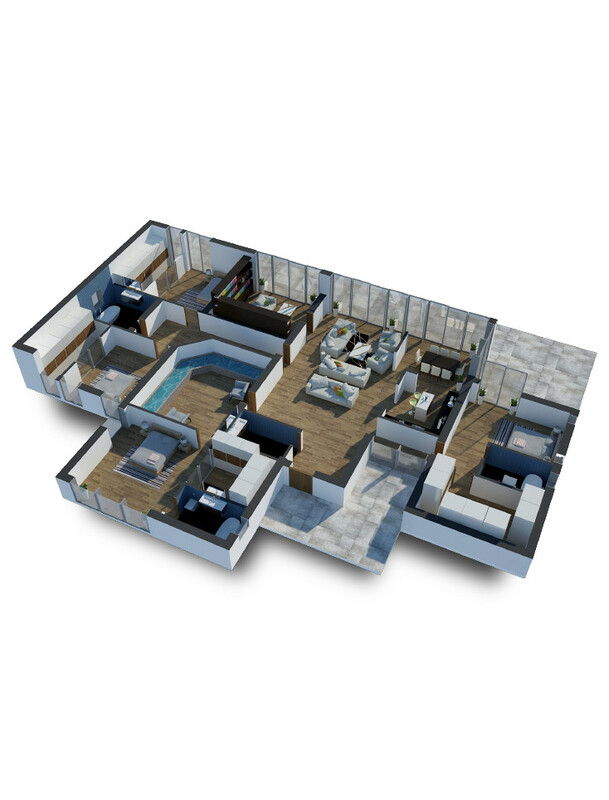 Modest room proportions don’t mean that everything in them has to be modestly proportioned! 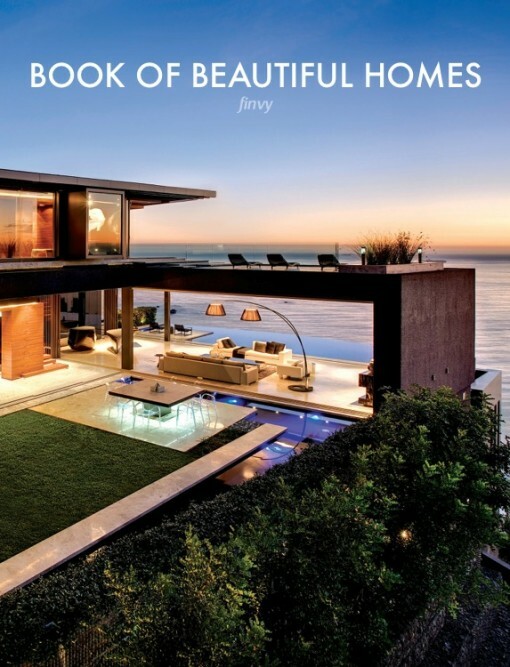 In fact, the designers of these four homes would probably argue quite to the contrary. 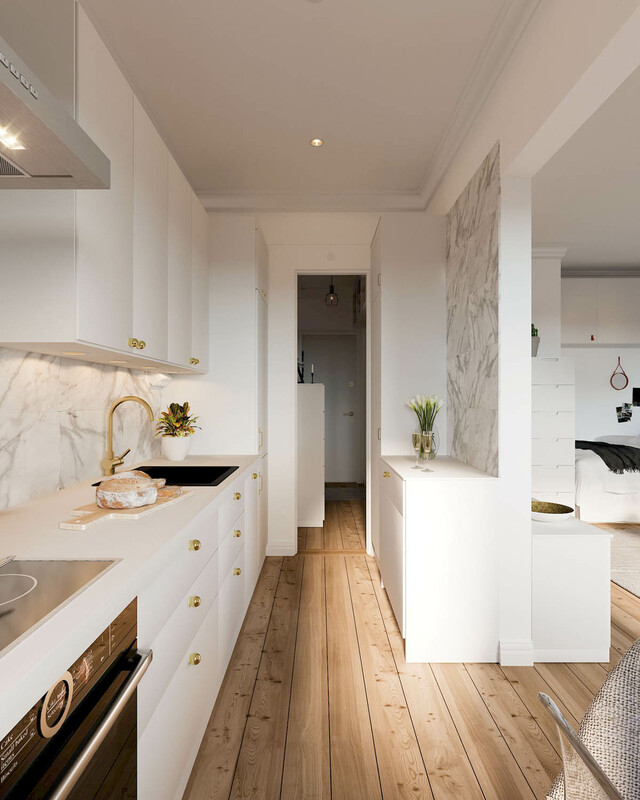 Kicking off the small home style scene is this 31 square metre studio apartment in Stockholm, Sweden. 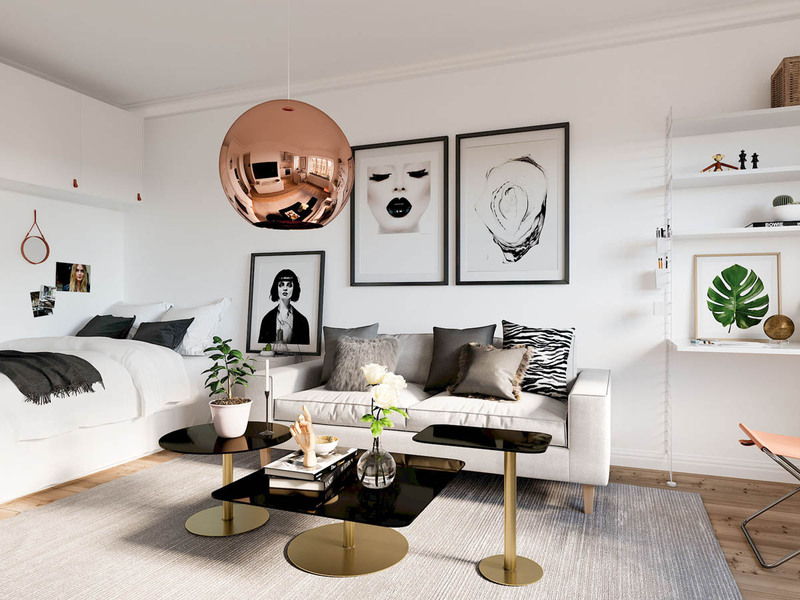 Hanging right in the centre like a chic sleek disco ball is a copper orb style pendant shade. 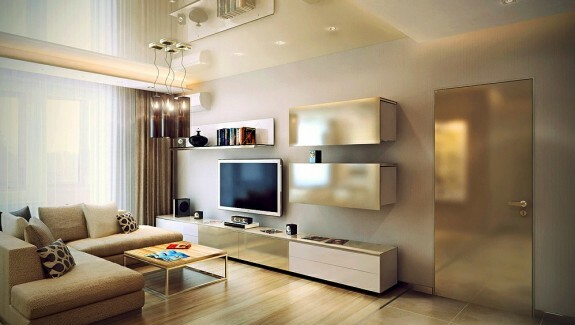 The metallic surface reflects the room, creating a smaller skewed version of the furniture, artwork and indoor plants. 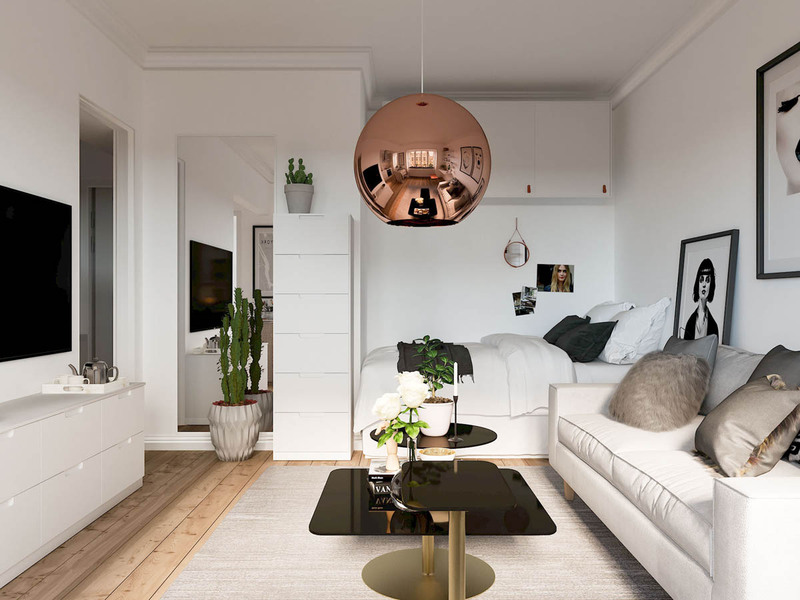 Beneath the copper lighting is a cluster of gold coffee tables with black glass tops at varying heights. The combination is a glamorous look that goes well with beauty themed artwork and loud animal print cushion. 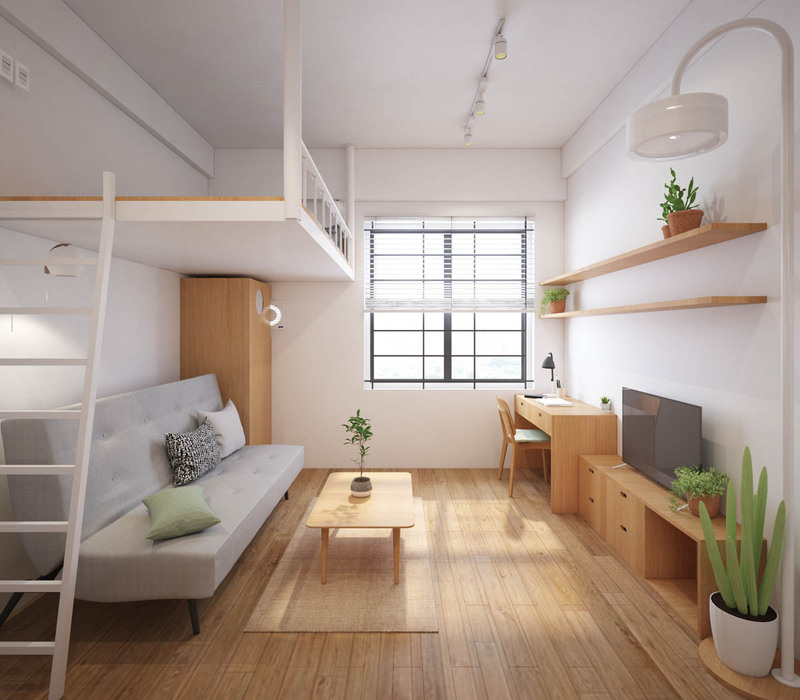 The bed is pushed to one side of the studio apartment, nestled in an alcove. 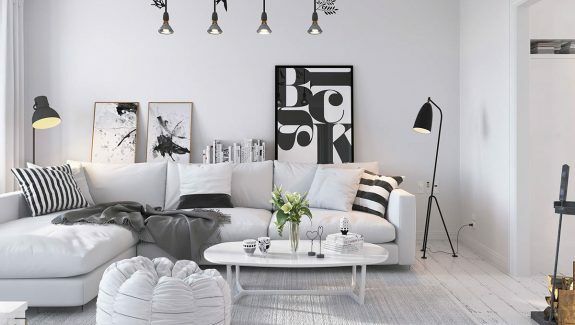 Its made up with layered cushions in a solid monochrome fashion. A couple of cacti decorate the space toward the foot of the bed, including one very large version that has to be sat on the floor in front of a full length mirror. The kitchen area contains an eating area with a couple of modern ghost chairs. 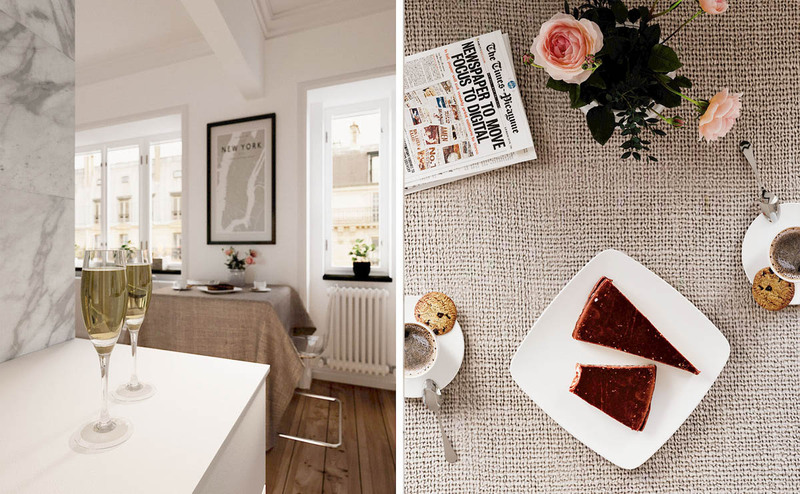 Beyond the bijoux dining spot lies a white minimalist kitchen that has been given the golden touch. Golden door-knobs decorate each of the units, and a matching golden faucet stands at a jet black kitchen sink. 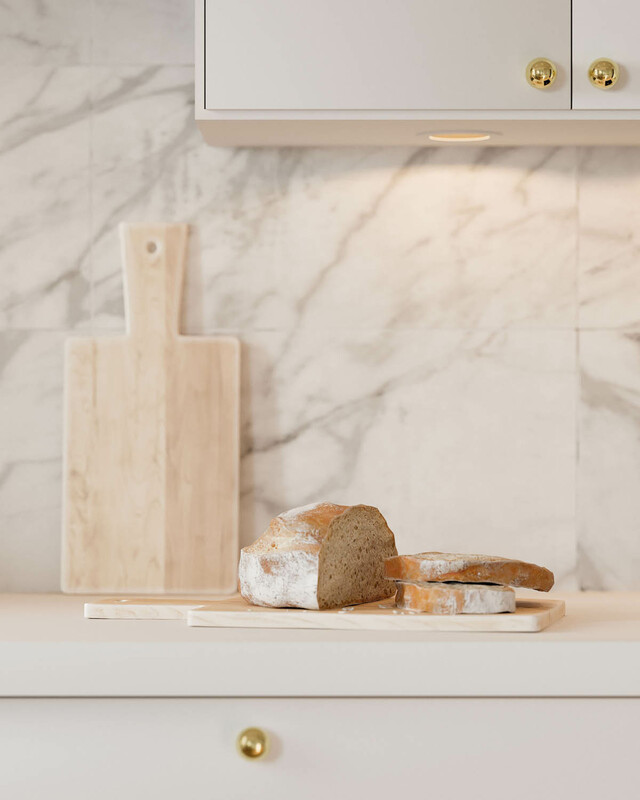 Pale wooden cutting boards protect a smooth white countertop. Sparkling wine glasses stand in front of a beautifully marbled backsplash. 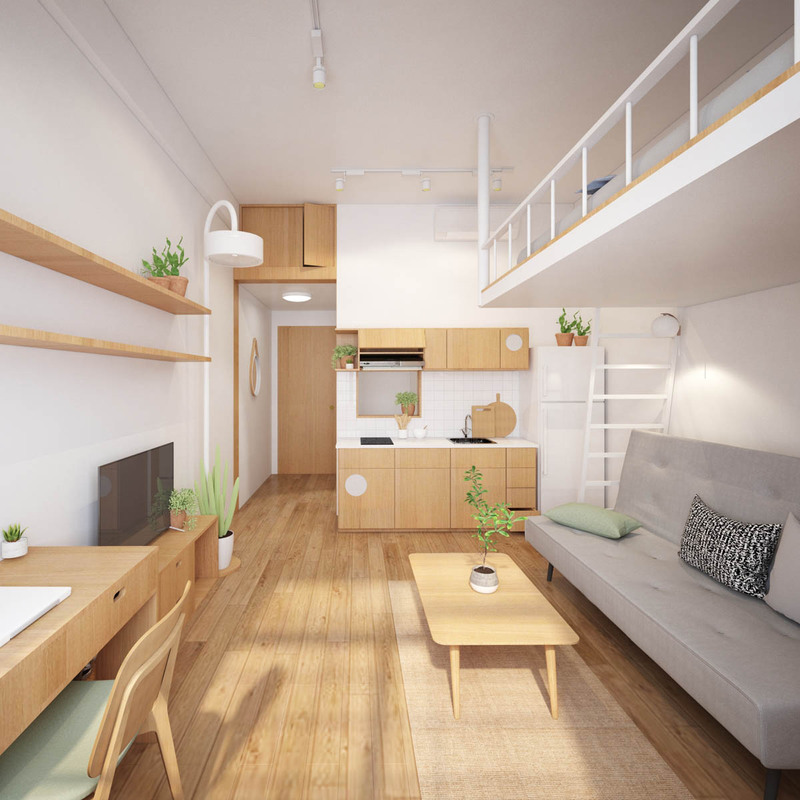 Our second small apartment with big ideas is a vision of wood tone and white. 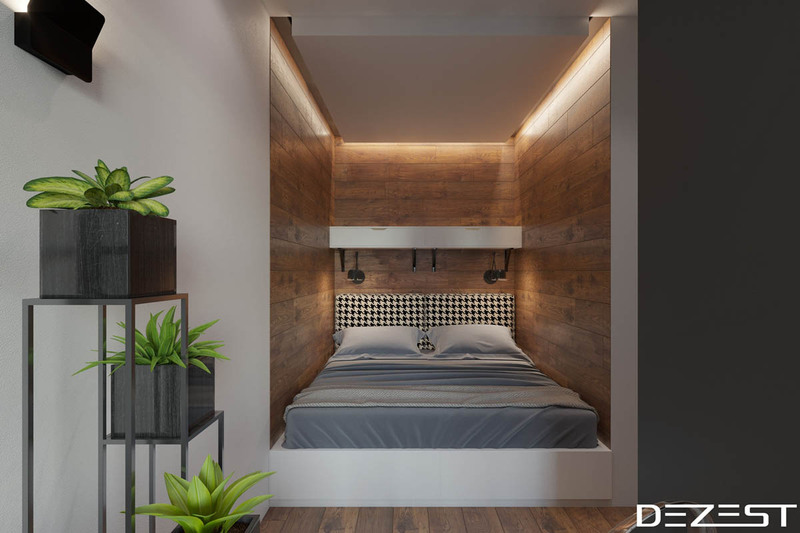 The vertical space of this small home has been utilised by installing a loft bed. 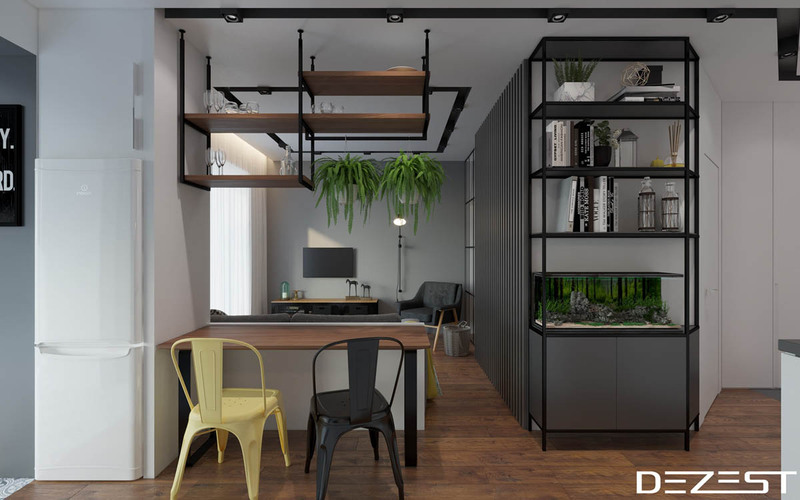 On the opposite wall, two long shelves have been mounted high on the wall. At the foot of a white ladder that leads up to the loft bed, the kitchen area is small but perfectly formed. Each surface of the honey coloured home is brightened by a fresh green house plant to breathe lots of life into the decor. 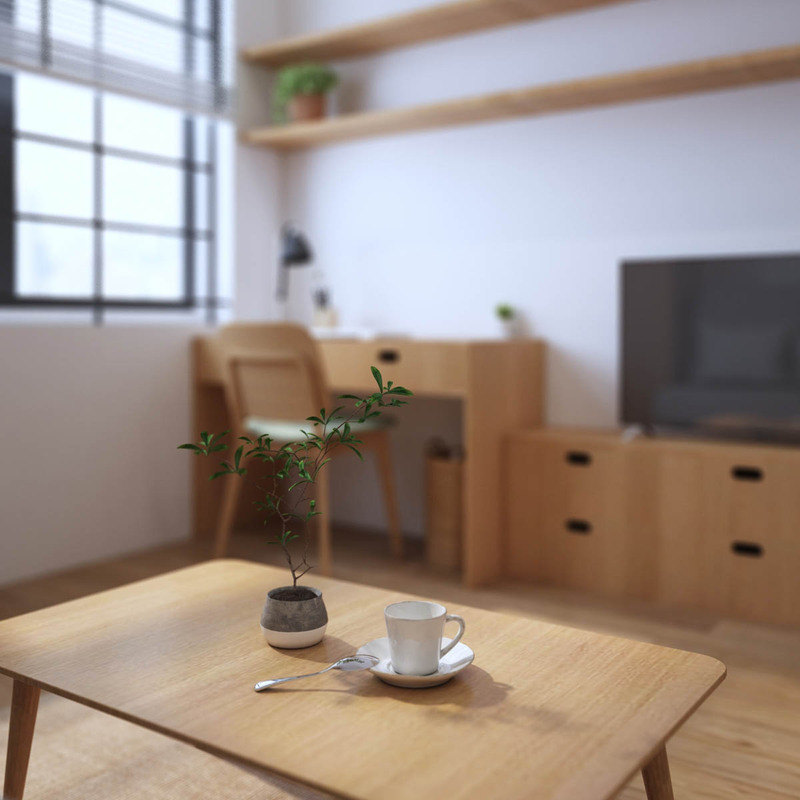 A neat wooden coffee table holds another small plant and the obligatory cup of hot beverage. 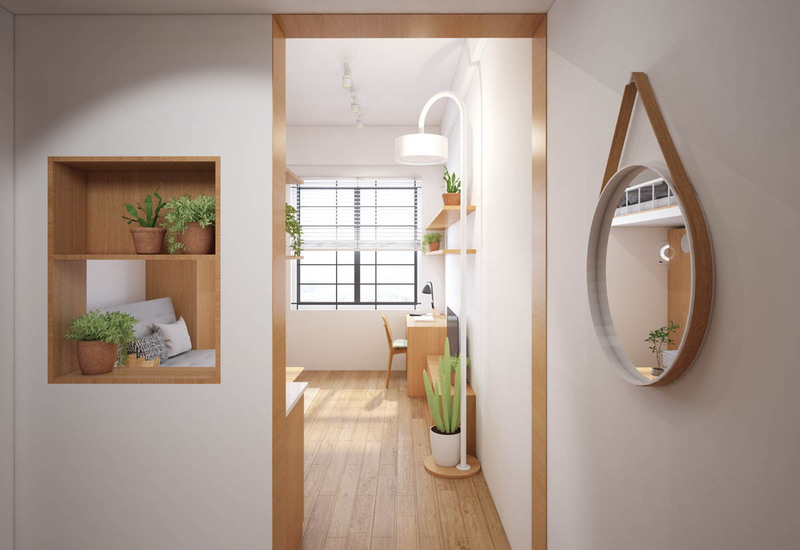 The home entryway has a window space that peeps through into the studio apartment. 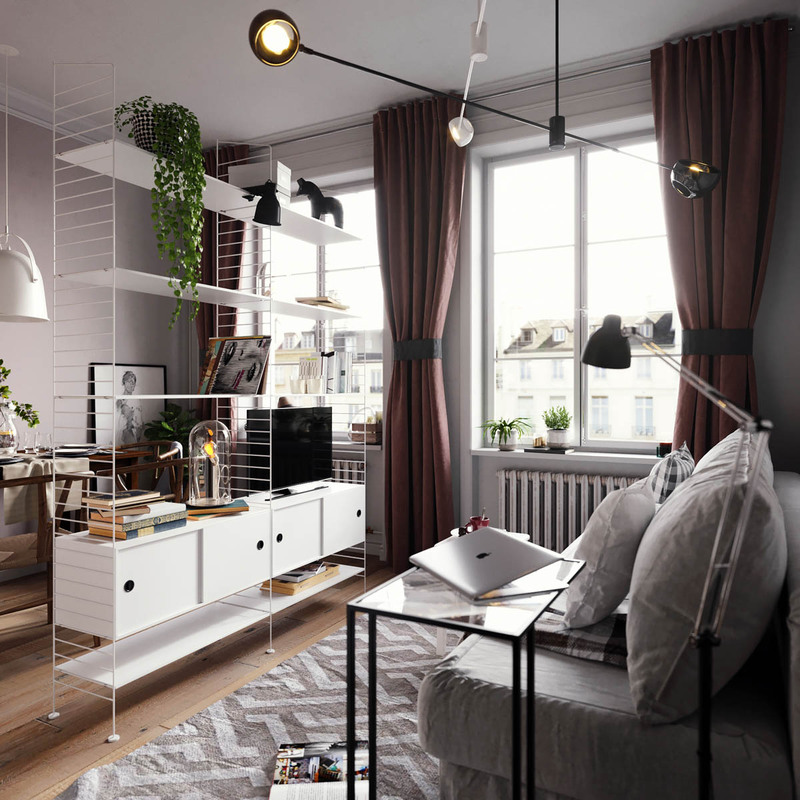 The first item beyond the entryway is a large unique floor lamp that stands tall in defiance of the tiny proportions of the home. 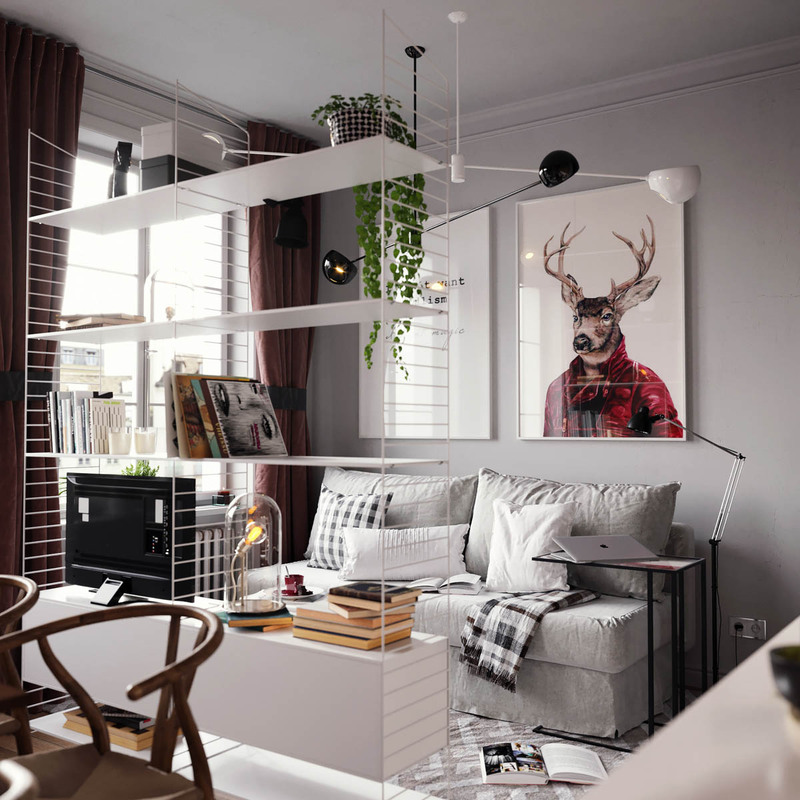 Small stylish space number three, located in Moscow, is packed wall to wall and right through the centre. Large kitsch art prints set an individualistic tone right off the bat. The colour in the artwork has been picked up in the warm looking curtains at the window. 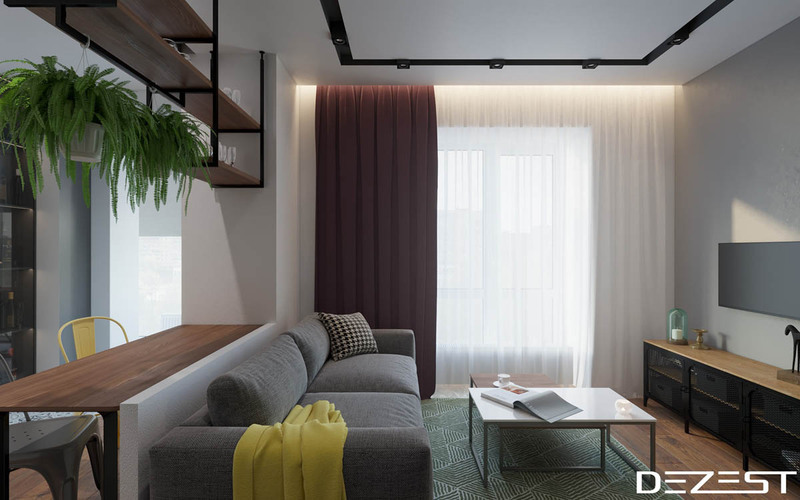 A modern light stretches its long reaching arms across the entire upper space of the lounge. 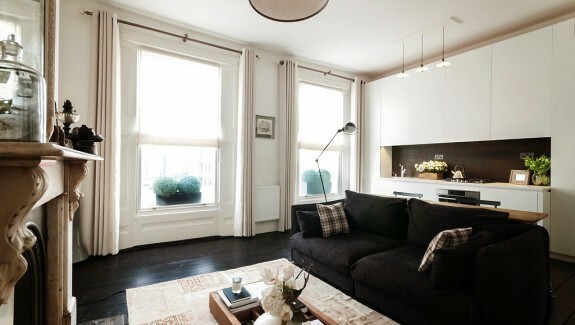 The small sofa is stuffed with cosy cushions and throws. 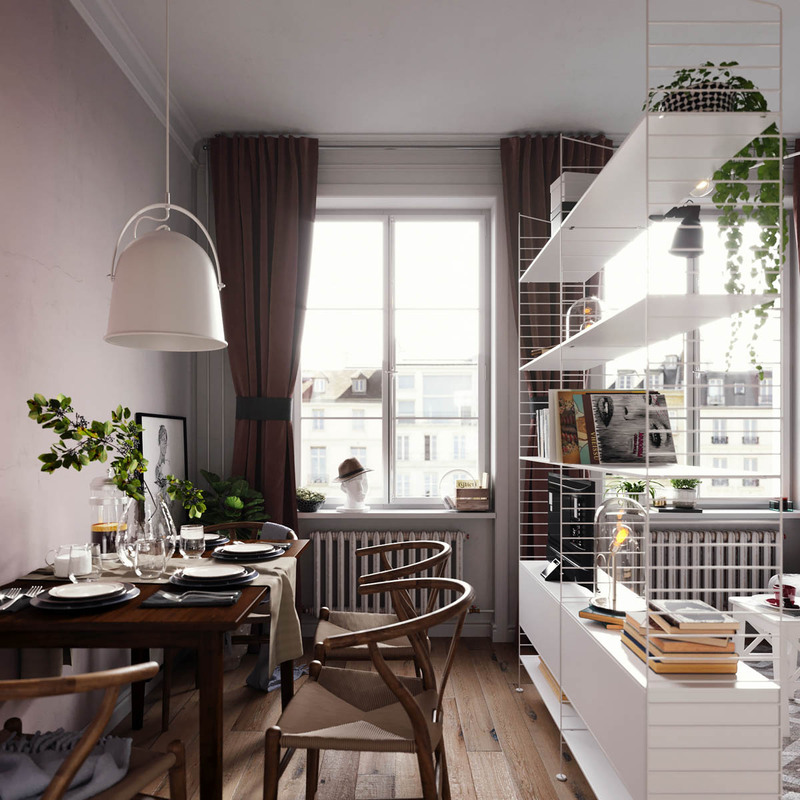 An adjustable shelving unit with lower storage volumes stands in the centre of the small space, creating a tall room divide between the living room and dining room. 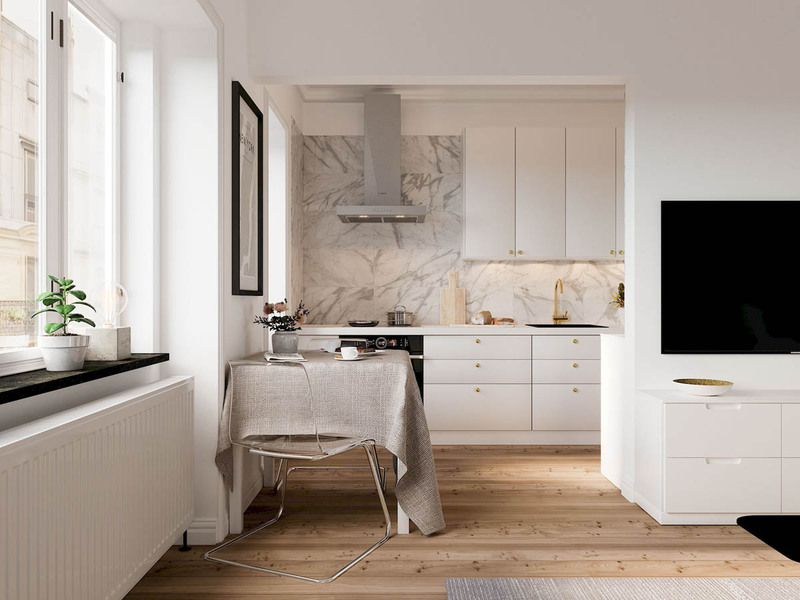 It also makes an ideal entertainment unit for a small TV set. Other shelves hold a selection of books and keepsakes. A patterned area rug adds further definition to the perimeter of the lounge. 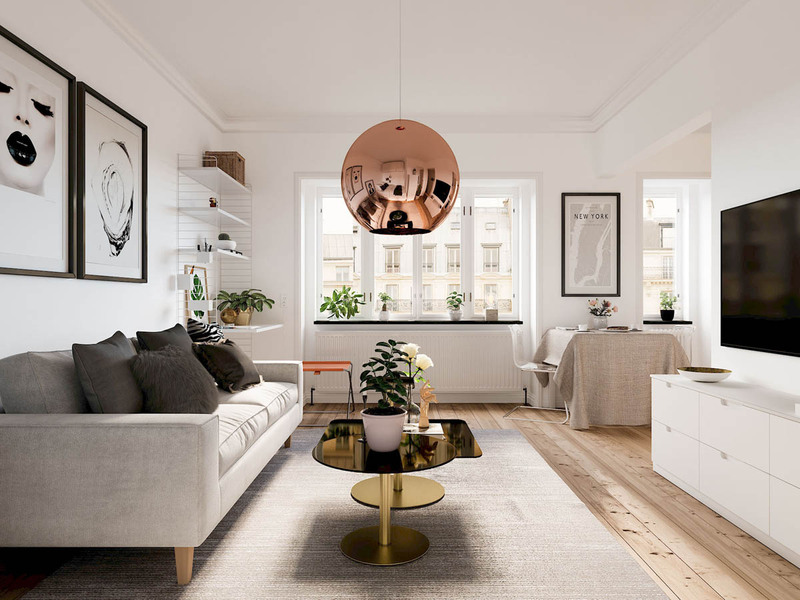 The eating area has a huge dining pendant light, another unusual choice for a small space. Running adjacent to the lounge and dining areas is the kitchen. 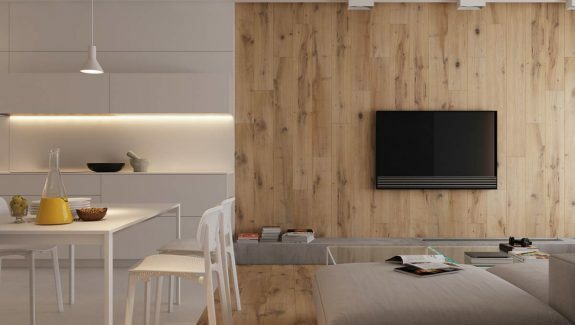 Wooden wall units contrast with white base units. 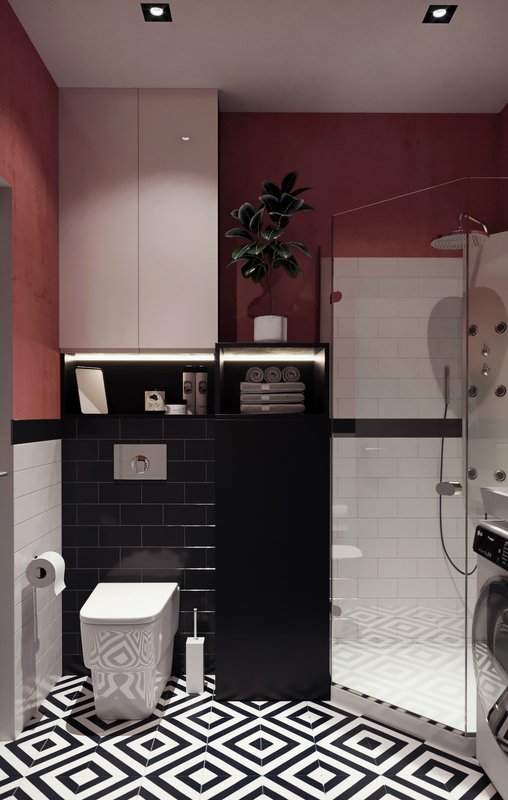 The walls of the bathroom are painted in the same ruddy hues found out in the compact living area, a very rich colour for a tiny room. The floor is tiled with a striking monochrome design. 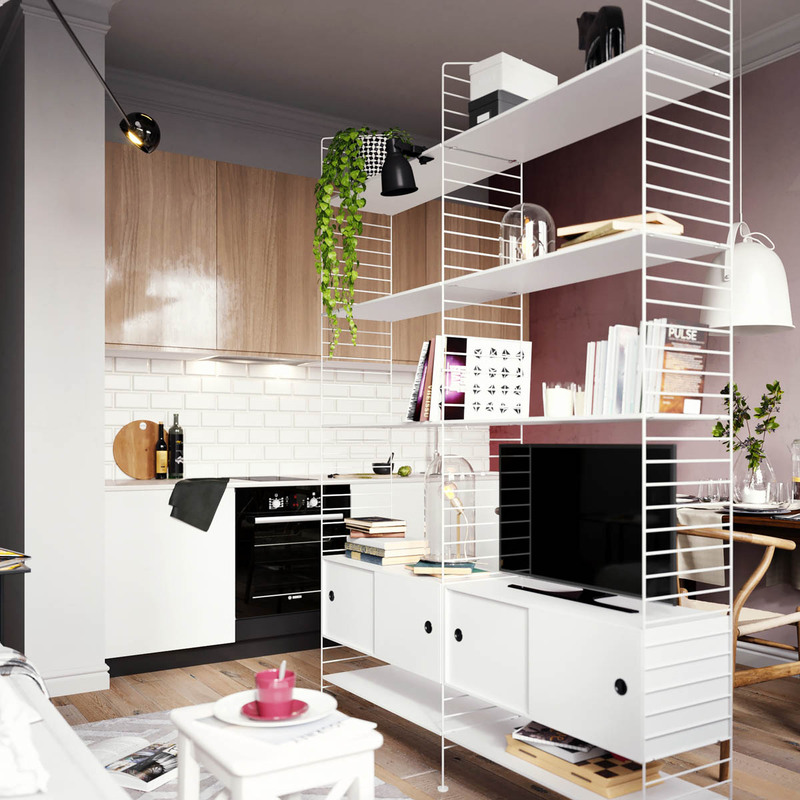 A vertical radiator slots into a narrow space, bringing in a stripe of unique contemporary design. 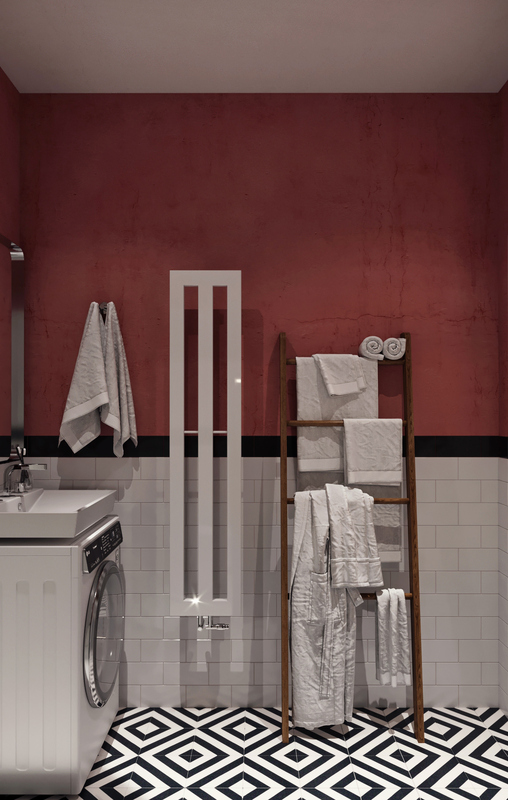 The bathroom basin is mounted directly above a washing machine in order to combat space limitations. 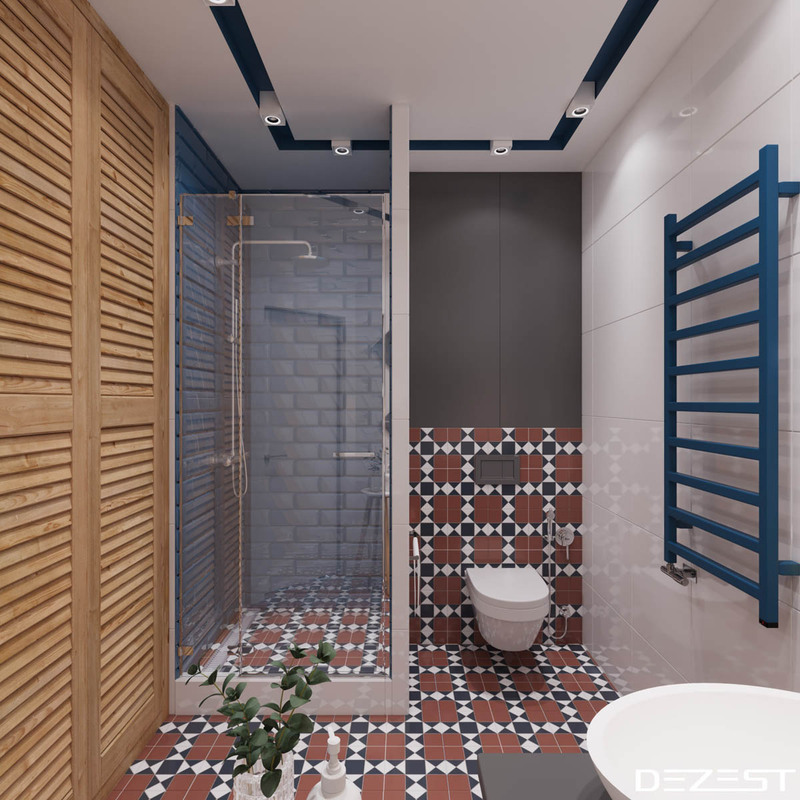 The fourth and last interior is 50 square metres of industrial home decor, located in Dnipro, Kiev, Ukraine. Here, cheerful yellow accents brighten a scheme of white, wood tone, emerald green and burgundy. 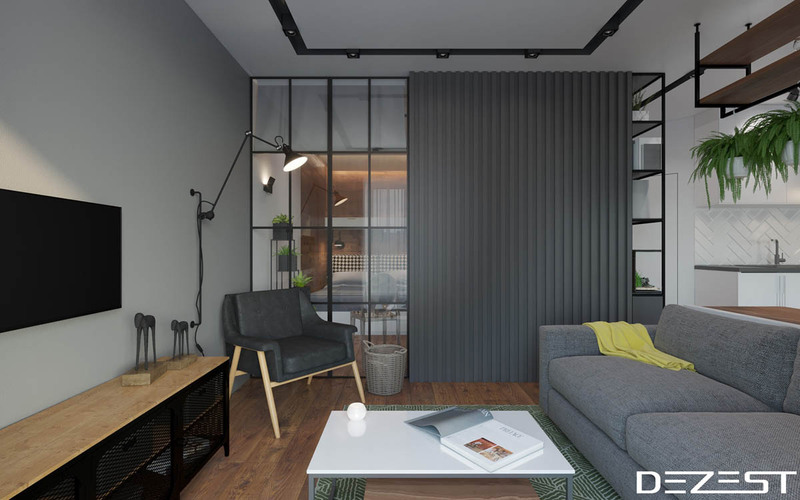 A swing arm wall lamp teamed with a stylish armchair makes a cool modern reading area. This one is a Lampe Gras Model 214. The home office takes advantage of natural light coming from dual aspect large windows. The stylish desk chair matches a grey built in bookcase. Beneath the wood and metal desk, the floor is tiled with heavy pattern. 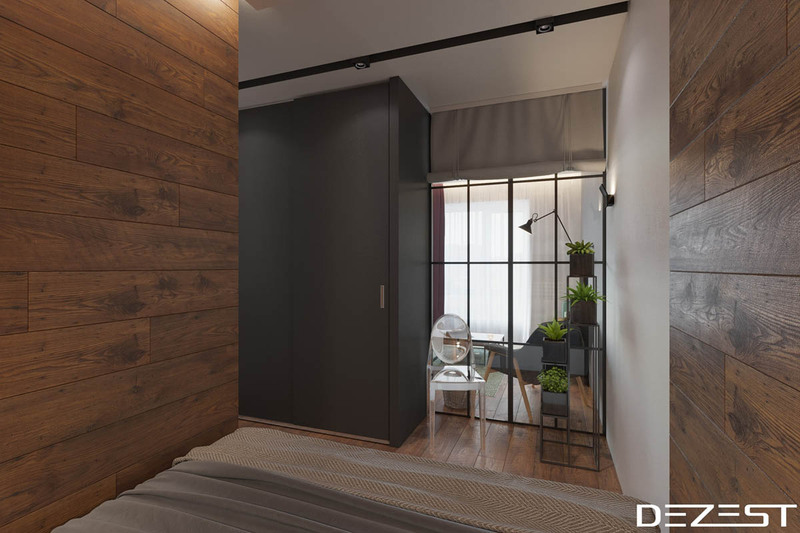 A narrow nook has been clad in wood tongue-and-groove planks to create a cosy cabin atmosphere around a double bed. The headboard is a bold monochrome houndstooth print. Unique plant stands decorate a small corner. 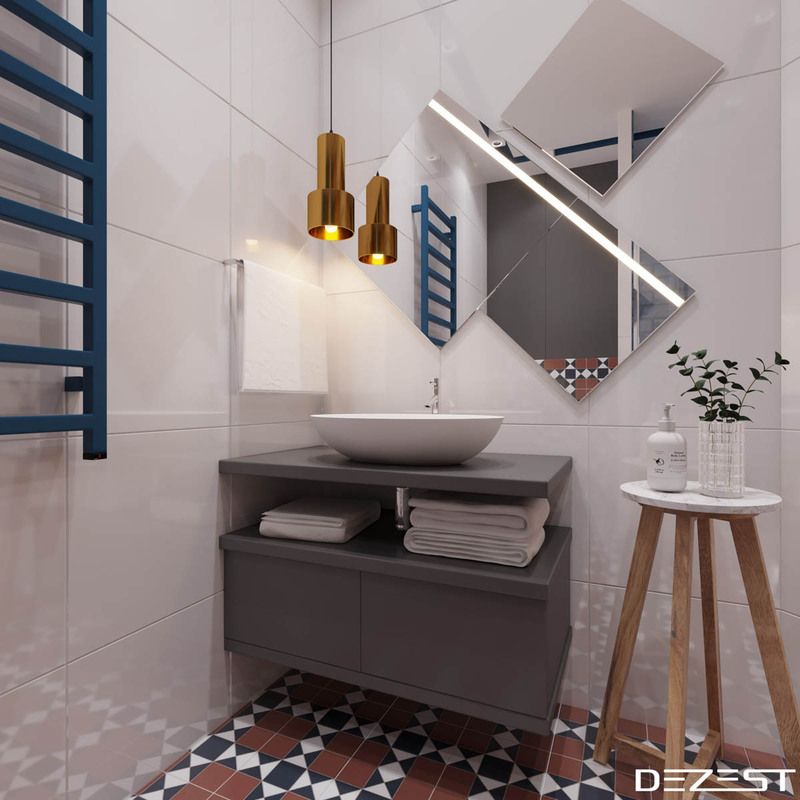 The bathroom holds a multitude of brave style choices, including a bright blue towel heater, golden pendant lights and geometric mirrors. 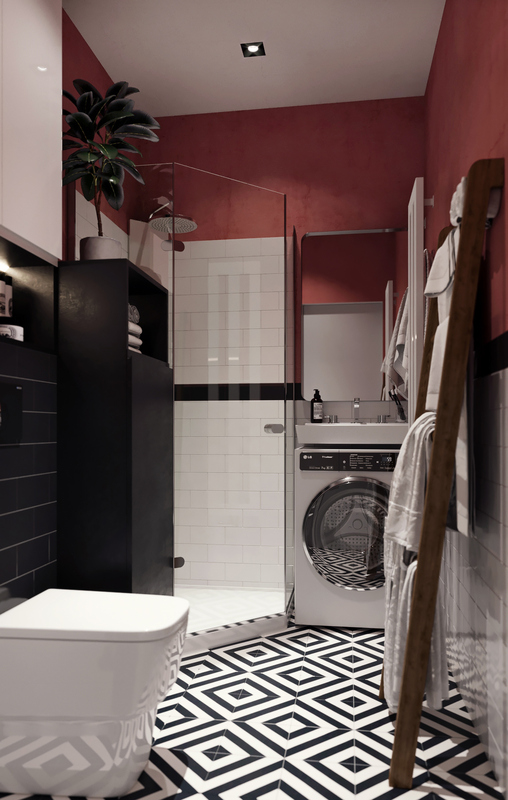 Down on the floor things get even bolder, with a busy tile design in black, white and roof red.